Text: The Exhibition under the above name, which we announced to the public a few days ago, was on Saturday submitted to private inspection, previous to it being thrown open to the public this day. 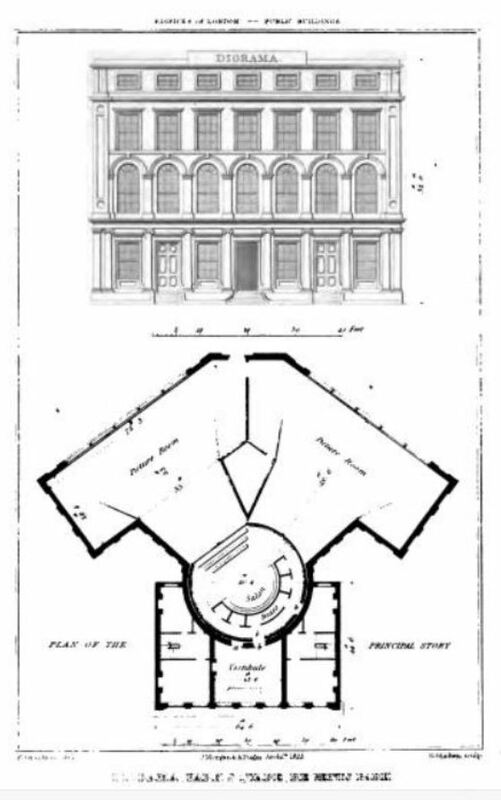 The immense building which has been erected for the purpose, is situated in the Regent’s Park, directly opposite the eastern side of Portland Crescent, and close to the Riding School. its magnitude may be judged of from the fact that the mere walls were raised at an expense of 8000l. The interior is also fitted up in a most costly and tasteful style. The saloon, from which the exhibition is viewed, is circular, and splendidly hung with crimson cloth, while the ceiling is formed by a transparency of elegant device, representing medallion heads of the greatest masters in painting. the accommodations for the public are in a style befitting the superior arrangements and construction of the whole. With regard to the exhibition itself, we think it better for two reasons, to abstain from any attempt at explaining the means by which its effect is produced. In the first place it might be prejudicial to the amazing interest with which every person must be struck who sees it; and secondly, the perfect novelty of the thing, and the extraordinary power by which it operates, almost makes us despair of giving an intelligible or a credible account of the little which a first visit has enabled us to ascertain. All we shall do, therefore, will be to describe the effect which a visitor beholds on entering the saloon. he sees before him a magnificent landscape, out into which nothing seems to prevent his walking but the benches occupied by lovely forms, whom his politeness will not permit him to disturb. this is the Valley of Sarnen, in Switzerland, perhaps the most enchanting specimen of all that is beautiful in natural scenery, that can be found even in that romantic country. In the foreground he will see a little rivulet rising and bubbling down its tiny precipice with all the animation of nature. Close behind it he sees a house, which wears the very air of invitation and hospitality. Then spreads out an expanse of country, decorated with every variety of rural charms. in its ample bosom rests a soft blue lake, and the distance is filled by mountains rearing their snow-crowned heads, and shining in all the diademic splendour which is conferred upon them by the sun’s rays. Suddenly, however, the beholder finds the brightness of the scene giving way to the approach of gloom. The hills lose their brightness, and the transparent blue of the tranquil lake is defaced by the reflection of the darkening clouds. A threatened storm passes off with all its fury to one of the mountaintops, and the beauty of nature is again vindicated by the restoration of her smiles and gladness. Having exhausted his admiration upon this magical delusion, he perceives that he, and all his fellow gazers, if they amount to three hundred, are receding from the view; and in a few seconds he finds himself looking up the nave of Trinity Chapel, Canterbury Cathedral. Here his wonder will be taxed to a still higher point; and he must hold fast of the impossibility with all his might, or he will conclude that some of the things which he sees before him are real and not imitative. We, of course, need not add, that the whole is pictorial illusion. It is altogether an exhibition unprecedented in its magnitude, and, in our opinion, far surpassing every thing of its kind in beauty. The Paintings rank high as works of art, independent of the astonishing interest they receive from this stupendous machine. We have been informed that above 12,000l. have been expended on the establishment previous to its opening. The price of admission appears at first sight to be high; but without considering the enormous expense to which we have alluded, we are sure that no one will think the money too much, after he has paid it. in short, the Diorama is an exhibition which every body must see. Comments: The Diorama was the invention of Louis Daguerre, later one of the inventors of photography. The diorama was a visual spectacle presented in an elaborate theatre, able to accommodate around 350 people. 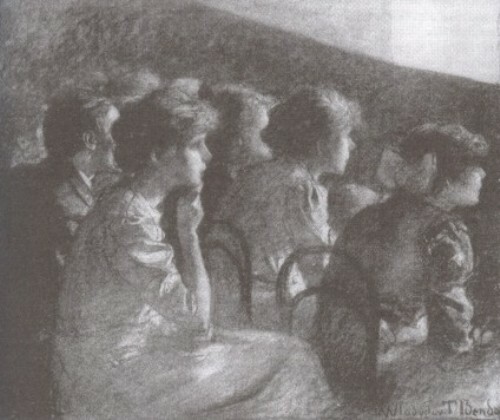 The audience would viewed a large-scale landscape painting on a screen 70ftx45ft whose appearance would alter through the manipulation of lighting and scenic effects. A turntable would then rotate the audience around to view a second painting. The Diorama premiered in Paris in 1822, and opened in London at Regent’s Park on 29 September 1823 in a venue designed by Augustus Pugin (father of the architect of the same name). Daguerre himself was one of the artists who produced the paintings. The Diorama was a considerable popular success, and was followed by a number of imitator attractions. It was opened from 10am until dusk. The show lasted around 15 minutes. The prices of admission were 3 shillings (for seats in boxes), 2 shillings (standing in the ampitheatre), children aged under 12 half-price. This entry was posted in 1820s, Newspapers, United Kingdom and tagged Decor, Dioramas, Lighting, London, Prices, Seating. Bookmark the permalink.